My paintings and photographs are a visceral response to my immediate environment and the sensations and impressions that I experience. I come across seemingly mundane moments such as sun dappling through autumn leaves, the play of light on water, patterns of light and shadow, the texture and colour of dilapidated buildings and machinery, or the sudden flood of light through an old window. 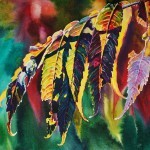 I interpret my response from a number of artistic techniques including watercolour, oil, acrylic, encaustic and photography. 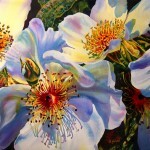 The subject of the painting usually dictates to me the medium I use. My paintings are usually of the natural world including close-ups of flowers and leaves, seasonal images, landscapes and waterscapes. Often a subject will be a minute detail of shadow cast on the single leaf of an autumn maple, or the gossamer petal of an iris in morning light, which I immediately envision in large scale luminous watercolour. In other cases the green-gold expanse of a canola field or the play of reflections on water will dictate the impasto brushstrokes of oil or acrylic. At times I need to record the rich texture and graphic shadows of fallen buildings and crumbling concrete immediately with my camera. I the I then try to evoke in the viewer the same initial exhilaration and original impact of what I am viewing and recreate that feeling.